As I brainstormed ways to welcome in my 29th year, I knew I wanted something relaxing, reflective, and slow-paced, with a hint of adventure. One of my college friends, Malaika, is from and lives in Grenada and has been trying to get me down there for a while. 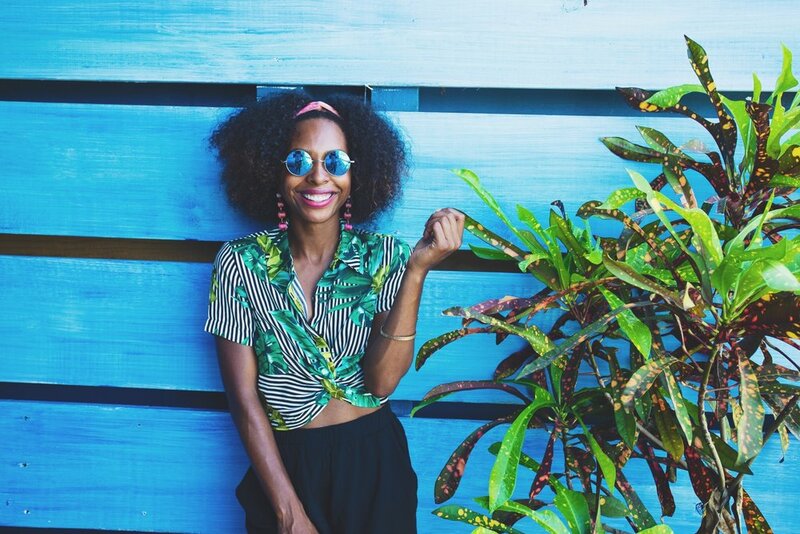 Malaika is a Yoga Teacher and helps put on a lot of retreats in Grenada. 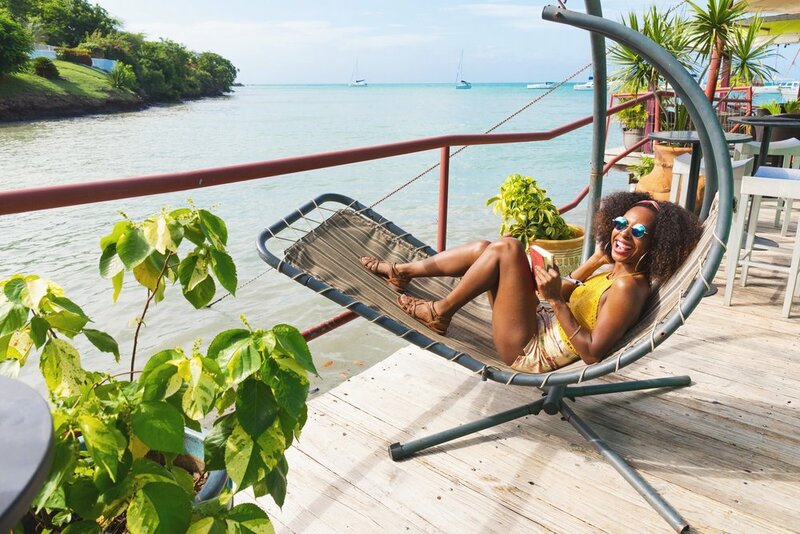 She told me about a Scuba Yoga Day retreat happening at the True Blue Bay Boutique Resort, and I immediately knew I found my birthday trip! I’m always up to challenging myself. I’ve had a paralyzing fear of the deep ocean for years, so I decided to use this trip as a way to conquer my phobia. I started taking swim lessons two months prior to my trip to help me get comfortable in the water. 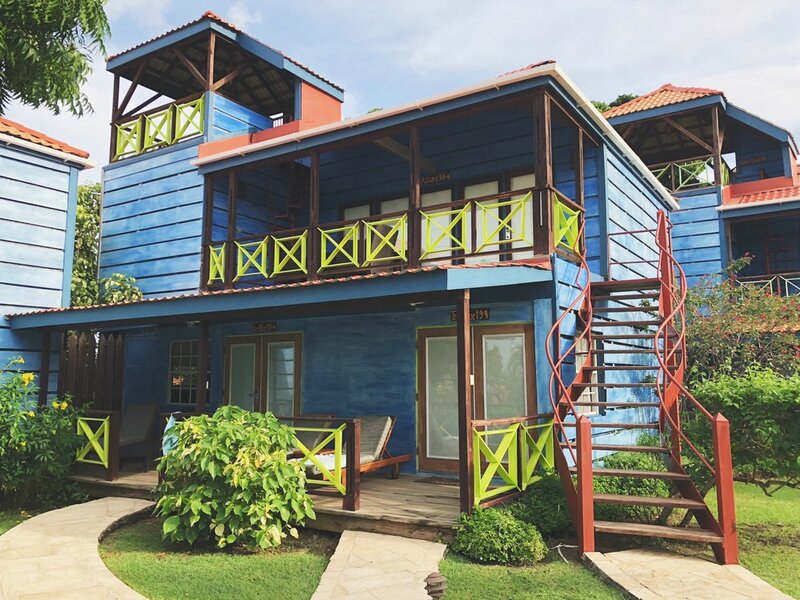 My solo adventure to the Scuba Yoga Day retreat and staying at True Blue Bay helped me enter year 29 feeling rejuvenated and recharged! As soon as I arrived at True Blue Bay, I was immediately happier. 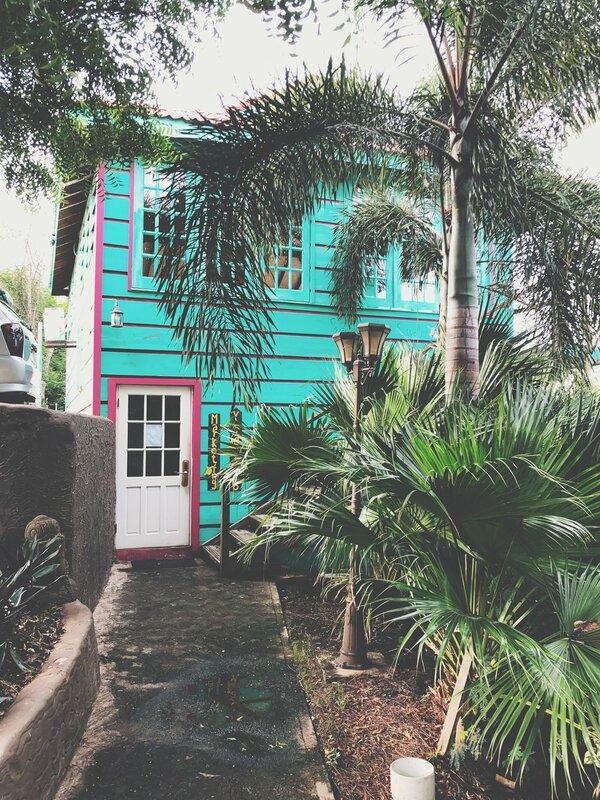 The colorful buildings and decor are the epitome of Caribbean comfort and charm. True Blue Bay has a variety of accommodations to suit their guests—villas, suites, and rooms. The villas are luxurious two bedrooms units with a private lounge pool. They are just steps away from the beach pool. There are four types of suites at True Blue: Tour Suites, Garden View Suites, Waterfront Suites, and Honeybee suites. I stood in the Waterfront suite, where I had an amazing view of the marina and the bay from two patios! The patio was the perfect place to get some journaling done. Also, my bed was incredibly comfortable. Sometimes I have a hard time falling asleep in beds other than my own, but the sounds of the water put me right to sleep. The villas and suites are perfect for couples, family, or group trips. There are three types of rooms at True Blue: True Blue style rooms, Indigo rooms, and Bay view rooms. These rooms are simpler in design, yet still as cozy as the others. True Blue is building more rooms that should be available in January 2019. I toured the resort facilities, and I noticed that each type of room had a Caribbean chic vibe (high ceilings, vibrant decor, and very spacious). Also, no matter your room choice, you get a gorgeous view of the garden grounds or the water! 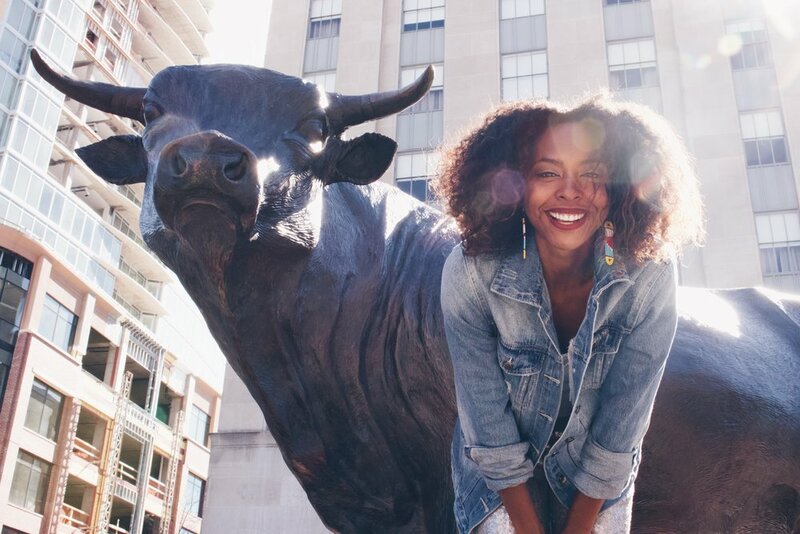 With climate change becoming more and more apparent, I’ve been working hard to become a more environmentally-conscious traveler. True Blue was rated the 2nd most environmentally sustainable hotel in the Caribbean. They even have a Green Group on site to ensure that they are doing the best they can to keep the hotel eco-friendly. The new rooms that they are creating will be powered by solar energy! The staff at True Blue were incredibly friendly and accommodating. My flight back home was in the late afternoon and I was able to check out a little later. They truly fulfill their mission of “making guests happy and being happy while doing so”. One unique feature the hotel offers was a complimentary turn down service in the evening where housekeeping freshen up the room, refill the ice bucket, and give you a delicious Grenadian chocolate. I made the mistake of thinking I would be able to get a reservation to the Blue Haven Spa upon my arrival to True Blue. The spa is popular among both locals and people staying at the resort, so they are almost always booked. They offer all the standard spa services, in addition to, special chocolate spa packages like chocolate facial, chocolate body wrap, and a mocha body scrub. 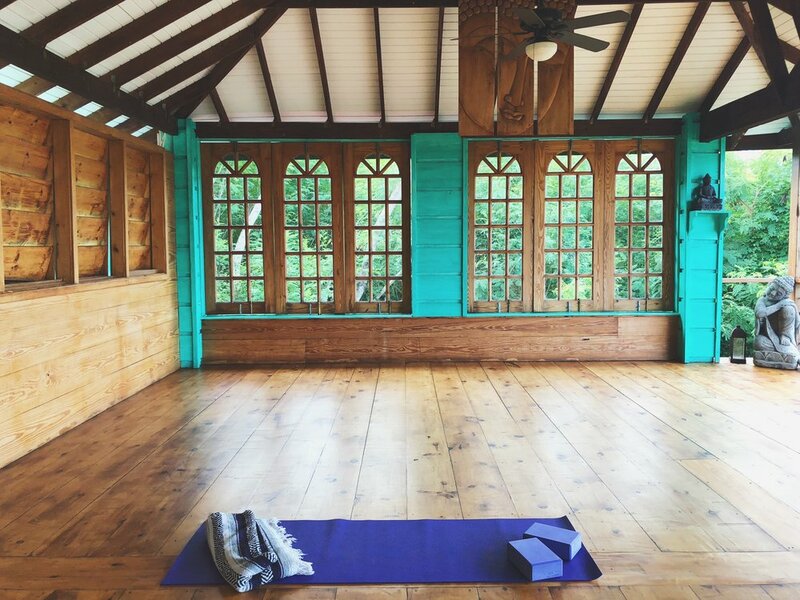 One of my many highlights of staying at True Blue was taking yoga classes at the Sankalpa Yoga Studio. It’s a beautiful tree top ocean view space. The teachers specialize in Hatha Yoga, Vinyasa Flow, Yin Yoga, Yin Yang Yoga and Therapeutic Yoga. There are also a variety of water sports activities available to guests. 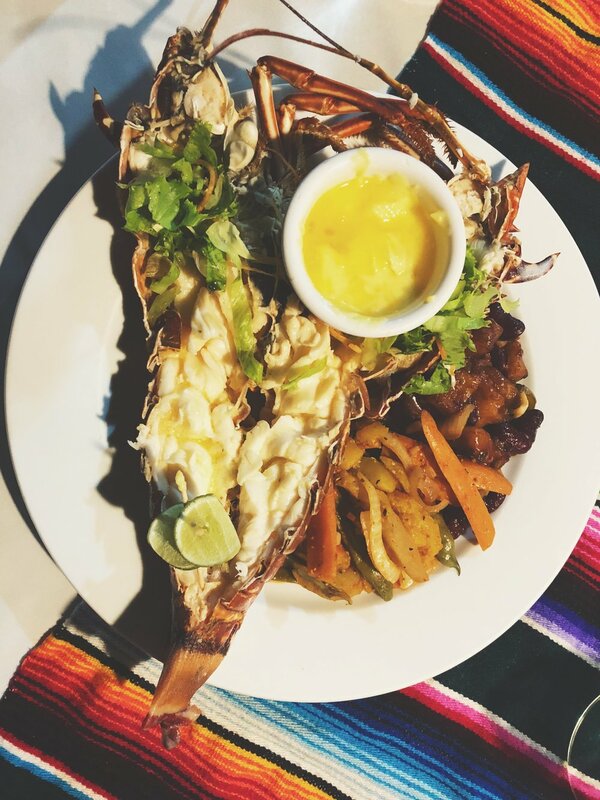 I loved how I didn’t have to get off the resort to taste delicious, authentic local food. 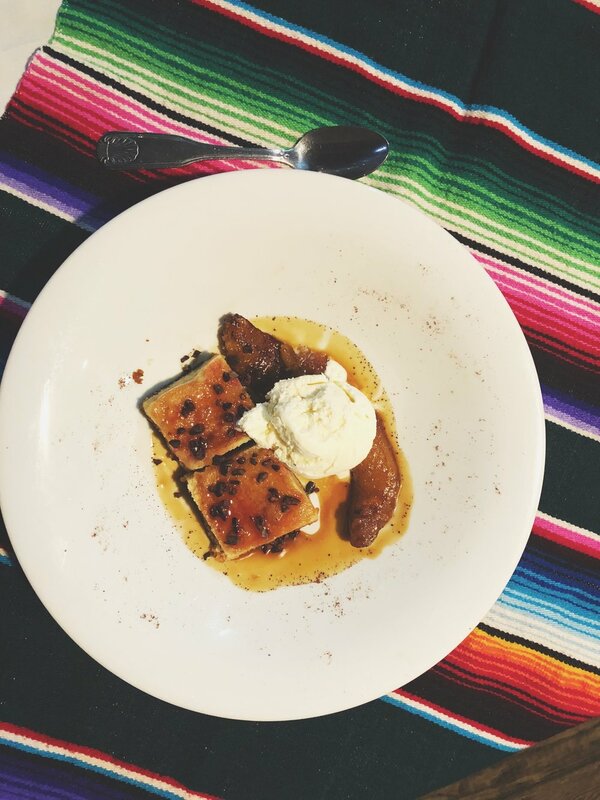 The onsite restaurant, Dodgy Dock, offers an array of local and international cuisines. I enjoyed the abundance of fresh fruit juices and tea available during breakfast. Dodgy Dock is expanding its menu to include more vegan and vegetarian options. The restaurant is a beautiful open space with a lovely view of the marina, but it comes with a price…,birds!! There were birds everywhere and they will try to steal your food, so make sure you cover it if you step away from your plate. Day retreats are perfect for people like myself who have limited vacation time. I felt like it was the best of both worlds, because I was able to experience something unique while still having time to get off the resort to explore the country. As mentioned, I decided to go on a Scuba Yoga retreat to push myself to get more comfortable in the water. I took swimming lessons to prepare for the trip, however you don’t really need to know how to swim to scuba dive. Your equipment does most of the work for you, your biggest responsibilities will be breathing through your mouth and kicking your legs. At first, scuba and yoga may seem like a random combination. But it is the perfect combination if you have any nerve around diving. The yoga relaxed us, kept us present, and regulated our breathing — all practices that lend themselves well to scuba diving. We started our morning with introductions and a relaxing gentle flow yoga session focused on the concept of Ahimsa (non-harming) led by Malaika. Ahimsa is a foundational yogic principle, where we approach nature and all our fellow beings with a deeper awareness and compassion. After yoga, we ate a delicious hot breakfast together at the Dodgy Dock. 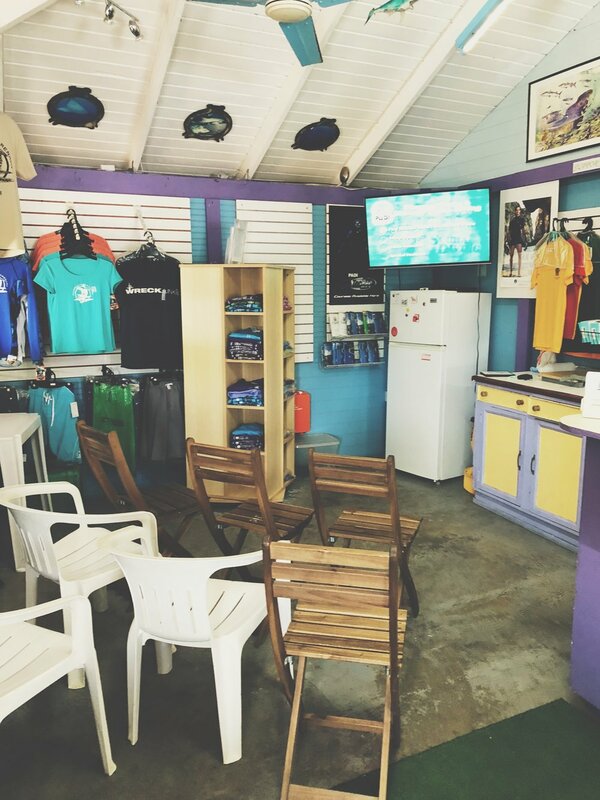 The Scuba diving portion of the retreat was led by talented staff at Aquanauts Dive Grenada. 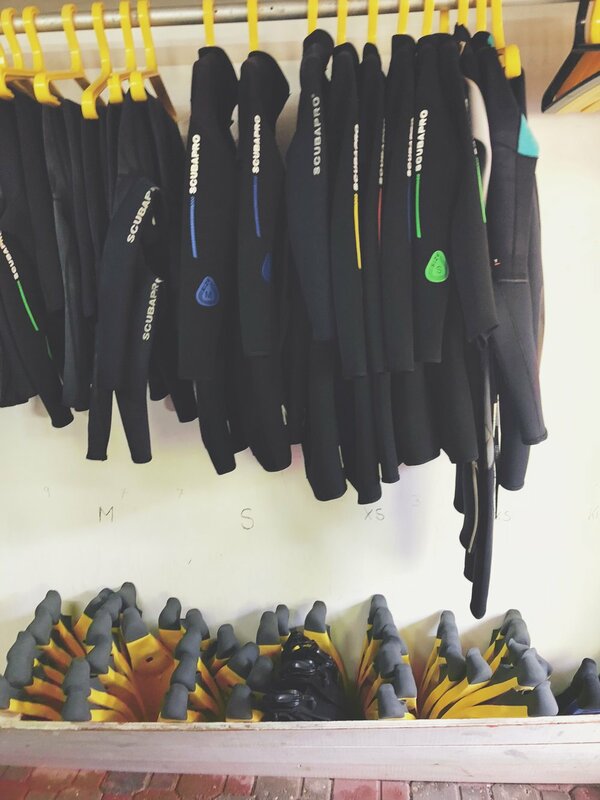 A major drive behind Aquanauts is conservation through a stronger connection to the ocean. Following breakfast, we completed our short Discover Scuba Diving course (a short video and a quiz), grabbed our scuba gear, and then practiced in the pool. This is when I really appreciated the small intimate group size. We were accompanied by 2 dive masters who worked with us in groups of 2-3 in the pool. We weren’t rushed and were given the attention we needed. Unfortunately, due to a really bad thunderstorm the previous day, the visibility in the ocean was poor, so our ocean dive was postponed. Although, I was a little bummed by this, I appreciate the Aquanauts doing their due diligence to check the ocean’s conditions prior to our dive. The majority of the group were first-time divers, so it wouldn’t have been a great first diving experience to explore in murky waters. 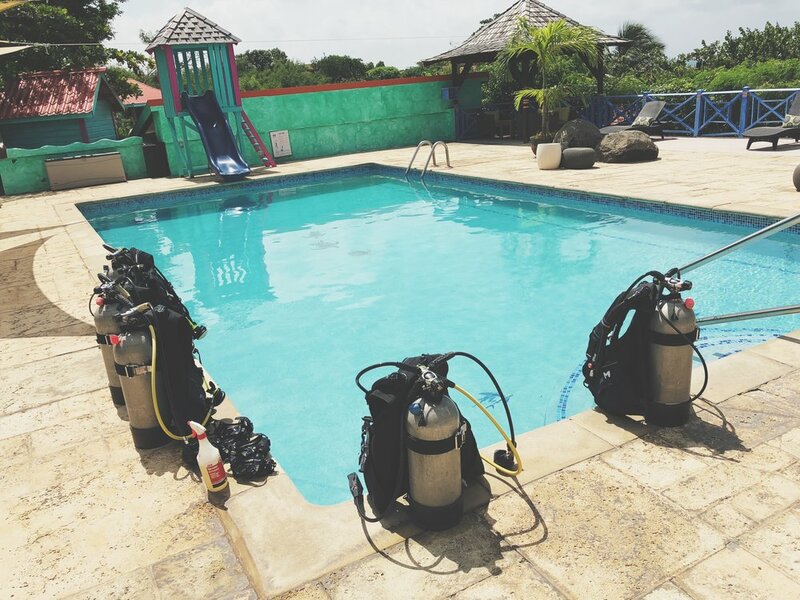 Despite, not being able to dive in the ocean, I still enjoyed developing my scuba skill set in the pool, and the interruption gave me another reason to come back to Grenada! We ended the retreat with a mouthwatering lunch at Dodgy Dock and lots of laughs. Another special part of the retreat was the amazing people I met. It was group of 8 people — a good mix of locals and Saint George’s University students. The Scuba Yoga Day was actually my first wellness retreat and now I’m hooked! 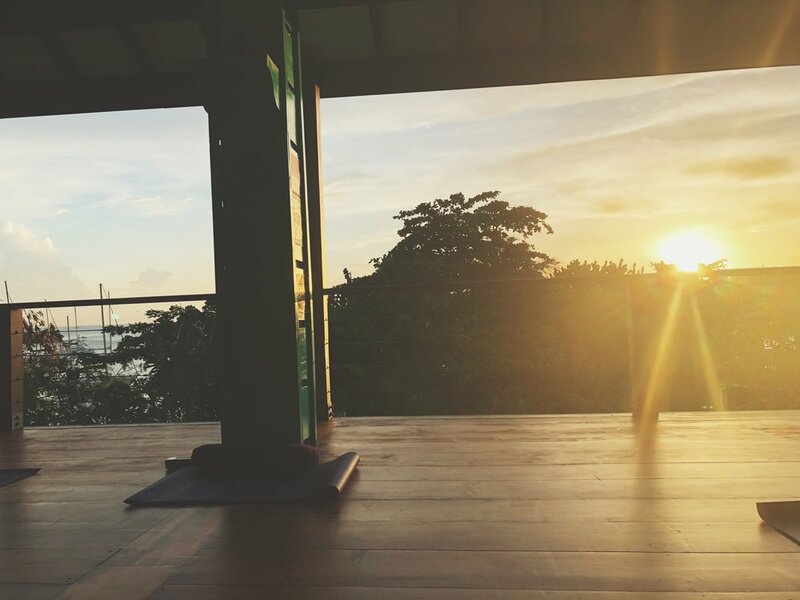 A retreat can be an unique way to explore a new destination. For those who are scuba certified, True Blue will host a 7-nights Scuba Yoga retreat including 6 yoga classes and 6 scuba dives starting in July 2019. Have you’ve ever been on a retreat? Let me know about your experience in the comment box! 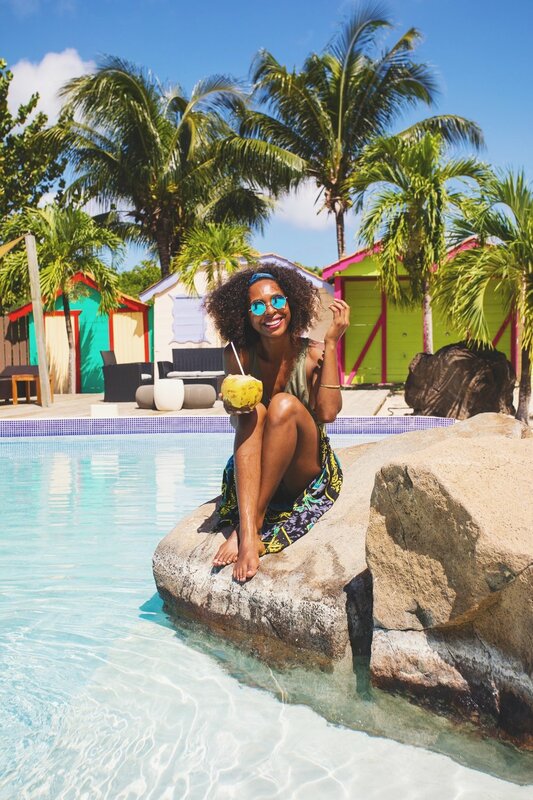 Disclaimer: I was a guest of True Blue Bay Boutique Resort, but all opinions here are my own. This post contains affiliate links, which means I earn a commission (at no extra cost to you) if you purchase from them. Thanks for supporting the free content on this site!